Begin by rinsing the quinoa. Prepare according to manufacturer's recommendations. 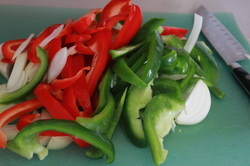 While the quinoa is cooking, rinse and sliced your peppers and onions. 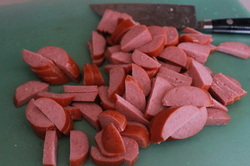 Slice the sausage and cut in half. In a large sautee pan, add some olive oil or no-stick cooking spray. 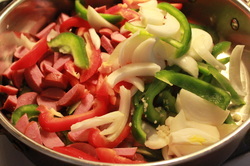 Add sausage, peppers, onions, and garlic. 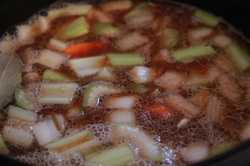 Sautee until vegetables soften. Add mushrooms and tomato sauce. Stir to combine. Simmer 10 to 15 minutes on medium low. This meal ended up being delicious and very filling. The quinoa is packed full of protein making it a more filling option than rice. 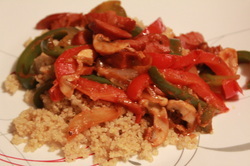 By using the turkey sausage (at 90 calories a serving) and quinoa, this healthy meal ended up being low in calories (only 403) and high in fiber (5.9 grams). It was very yummy and I must say I do like quinoa. Recently, my husband and I visited a local Asian restaurant one afternoon to enjoy some sushi (though he says my choice of sushi is not real sushi as I will not eat anything that isn't cooked). As part of the lunch special, we were given a choice of Miso soup or Hot and Sour Soup. I'd never had Hot and Sour Soup so I opted for that and loved it. Of course, we cannot afford to go out for sushi all the time so for Christmas I bought my husband everything he needed to make sushi at home. The only problem was, I wanted the Hot and Sour Soup to go along with it. 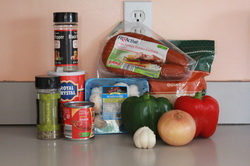 So began my mission to find a recipe that resembled what our local restaurant served. After surfing around the web and reading several recipes, I decided to try a recipe by Tyler Florence from Food Network as I have had great success with the recipes of his I have tried. 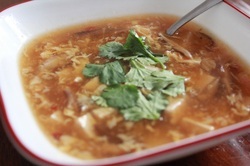 Surprising enough, this is the first Hot and Sour Soup recipe I tried and I think this is very similar to what we had that day. It's close enough that I'm happy with it. 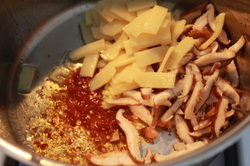 First begin by preparing the mushrooms, tofu, and ginger. 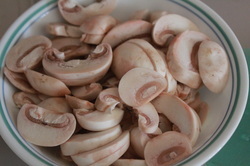 If you are using dried mushrooms, reconstitute the mushrooms with boiling water per the directions on the package. 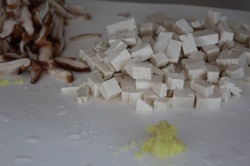 Chop the mushrooms and tofu into bite size pieces. Grate the ginger. 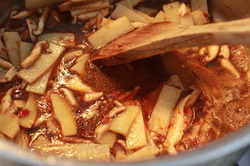 In a large stock pot, heat oil then add chile paste, bamboo shoots, and mushrooms. Sautee for 1 minute to infuse everything with flavor. 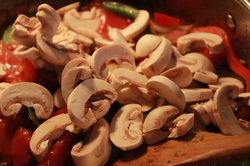 As your vegetables are sautéing, in a small measuring cup combine soy, vinegar, sugar, and white pepper. 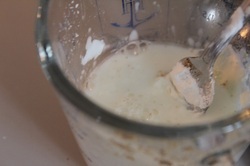 Add soy mixture to vegetable mixture. Simmer. Add chicken stock. 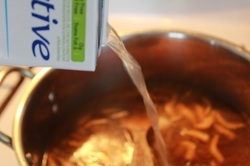 Bring to a boil and simmer for approximately 10 minutes. 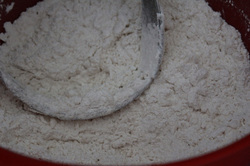 Meanwhile, combine cornstarch with 1/4 cup water. 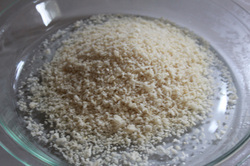 Mix well until lumps have dissolved. Stir in tofu and boil 3 minutes. 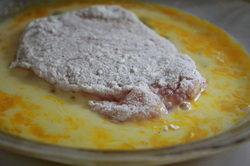 Add cornstarch and stir until thickened. 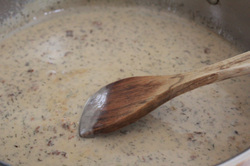 After soup has reached desired consistency, begin stirring soup in one direction to create current. 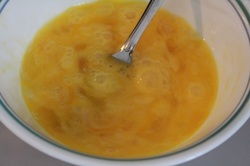 Remove your spoon and slowly pour the eggs into the soup in a steady stream. The egg will cook and feather out into the broth. Top with fresh cilantro and serve immediately. This one has some kick, so if you don't like things with a lot of "heat" to them, you may opt to reduce the amount of chile past you add. You'll definitely want a fair amount of beverage for this one. 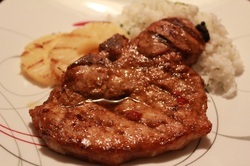 Tonight's mission was a super simple dinner with lots of flavor - Grilled Cuban Pork Chops. Yum! I found this recipe on my iCookbook (sorry, no link since it is an app I downloaded from the Windows Store). 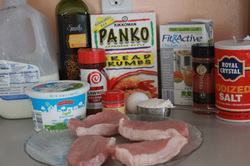 Don't be fooled by the lack of ingredients because these little pork chops are full of flavor. Begin by preparing your marinade. Mix together fajita mix and water, stir well to combine. 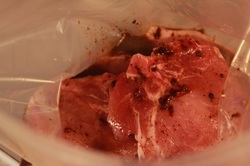 In a gallon size zipper bag, place the pork chops and pour marinade over meat. Seal bag and squish around to make sure the meat is coated. 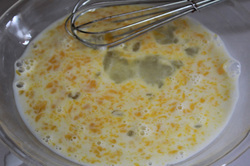 Place in refrigerator and marinade approximately 15 to 30 minutes prior to grilling. My husband manned the grill tonight so I didn't get any photos. Grill the pork chops and pineapple until cooked through, approximately 15 minutes on each side (total 1/2 hour). 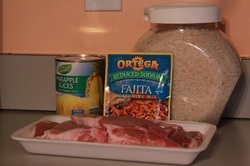 Serve pork chop and pineapple with rice. I added a couple of tablespoons of chopped cilantro, some lime juice, and salt to give the rice some flavor. This dish smelled amazing coming in from the grill and tasted great. This would make a great New Years dish! Normally I would take a picture of all the ingredients, but I got ahead of the game and realized I had already started cooking without taking the photo of the ingredients (oops) so I rolled with it. I was so excited to begin my mission. The summer before last, we made a detour through Atlanta, GA on our way to from the beach Gatlinburg, TN. We were on our way to see friends in TN and I made a slight detour (without informing my husband of my plans LOL) to the American Girl Store. Had I told him, he would've never agreed so...yea, I didn't tell him. What? I wasn't hurting anyone (though my husband and son may not have agreed as they were "tortured" to sit in this over-the-top decorated pink restaurant surrounded by little girls with their adorable dolls) and my daughter was super thrilled to see the American Girl store for the first time. She was, after all, in little girl heaven. Aside from the slanted-eyed look, I received from the men in the party, we ended up enjoying an excellent meal that night in lovely atmosphere. My husband and I both ordered the salmon dish that was available at that time. I'm not a "fish" person - I barely eat the stuff; however, our waitress gushed about how good it was and I was intrigued. I must admit, this was one of the best meals ever. I loved it! When we returned to the American Girl place in Washington, D.C. I was disappointed to see this dish was no longer available. I have thought about this dish many times over the last year and tonight I decided to try my hand to recreate something similar to what we had during our visit to the American Girl Bistro in Atlanta, GA. 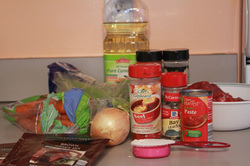 In a medium-size sauce pan, add 4 cups of water, 1 tsp sale, and 2 cups of white rice (not the quick cook type). Reference manufacturers recommended cooking time. While rice is cooking, slice scallions. After rice is cooked, place rice in a medium bowl and scallions. Stir to combine. This recipe requires marinading the salmon for at least 4 hours. 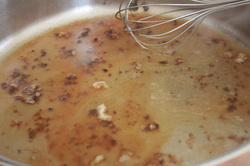 I actually began this process the day before and decided to marinade it overnight for a more vivid flavor. To make the salsa, you can do this the day before also or you can prepare it that morning. Begin by prepping your fruit and vegetables. After you have chopped and shredded your fruit and vegetables, combine in a medium size bowl with rice wine vinegar, water, sugar, and crushed red pepper flakes. Preheat your oven to 350 degrees. Heat a cast-iron skillet and add olive oil to the pan to ensure the salmon does not stick. When the pan is sizzling hot, add the salmon. Cook about 3 to 4 minutes. When salmon is seared, using a spatula turn each fillet. Sear the second size. Place cast-iron skillet in preheated oven and continue to cook 10 to 15 minutes. ***Please Note***Drain liquid from fruit salsa before serving. Serve rice topped with salmon and fresh fruit salsa. Again, this dish was daring on my part. My daughter typically refuses to eat salmon. She says it's "yucky". Tonight I decided to serve dinner and not really tell her what she was eating. She asked what it was and I just responded with a "do you like it?" She confessed to did like it and we left it at that. She ended up eating all of the salmon and most of the fruit salsa. She was pretty full and left some rice behind, but I would consider this one a keeper. While I cannot say for sure that it truly tasted like the dish at the American Girl Bistro, I must say this salmon turned out excellent and I will definitely make it again. It seems that these days, I'm in the mood to try something new all the time. I guess I'm just bored with food. It seems I can almost always eat Asian-inspired dishes and tonight was one of those nights. I decided tonight's mission was to try my hand at making Asian chicken lettuce wraps; however, I wasn't sure how well this would be received by my picky little 7 year old. She seems to like a lot of Asian dishes we have had at various restaurants, so all hope wasn't lost. Begin by preparing brown rice according to package instructioins. In a 10 inch skillet, add olive oil and heat. Add chicken and brown. 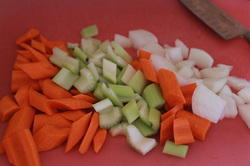 While chicken is cooking, prepare vegetables. 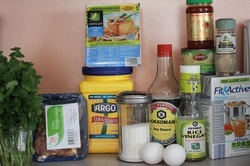 Add onions, garlic, soy sauce, rice vinegar, and hoison sauce to chicken. Stir to combine. 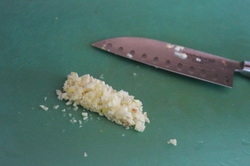 Cook until onions begin to soften, about 4 minutes. 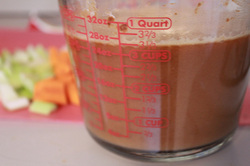 Add scallions, water chestnuts, and carrots to mixture. Sprinkle with ginger and black pepper. 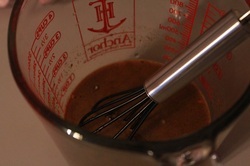 Stir to combine and cook and additional 2 to 3 minutes. Stir on lettuce leaves. Can accompany with brown rice. My daughter loved this meal! She ate everything which rarely happens so it must have been good. If you like your chicken to be a little more spicy, you can add 1 tsp Chinese Hot mustard or more to taste. I left this out because my daughter does not eat things that are spicy; however, this didn't really impact the taste of the dish as everyone in my family really enjoyed it! So I've been pondering for weeks how I would go about brining our turkey for Thanksgiving. After doing a bit of research online, I found that a lot of people recommend using a 5 gallon bucket to soak the turkey in the brine. After reading that I knew immediately that a 5 gallon bucket was not going to fit inside my refrigerator for several reasons - the shelves go straight across, I can't see putting that heavy an item on these shelves as they are made of plastic, and we can't just pop a shelf out because I still need room to put my other foods. With that being said, I began my mission to find a plausible solution that would still allow me to brine a turkey. I'm sure I'm not the only person out there thinking, really a 5 gallon bucket in my refrigerator? I know right away that none of my stockpots are large enough to hold a turkey and brine so that wasn't even an option. My first idea was to use some jumbo size bags I had left over from another project this summer; however, I discovered the bag wasn't big enough. Without losing hope, I thought there had to be an even larger bag. My mom was visiting and she had to make a trip over to the store and I asked her to see if they made any bags larger than the one I already had and I showed it to her. She returned with these XL Big Bags by Ziplock. I opened the box and I was positive this would work. My next problem was still where is this turkey going to live in the refrigerator because this thing is going to be heavy. Again, our new refrigerator's layout does not provide an easy solution. The shelf with the most height is at the top; however, again the shelf is plastic and there is nothing to support it. I was seriously concerned about the weight of the bird and water might actually break the shelf. So my husband and I begin to examine our options and I recommend he pull the shelf out of the bottom. Sure enough, the vegetable crisper fit on the top shelf (and weighs nowhere near what a turkey in brine weighs) and Mr. Turkey Bird fit nicely in the open space created at the bottom of the refrigerator. Brining problem solved! To make sure the water remained covering the entire turkey, we sealed the bag, then used some kitchen twine to tie the bag up so the bag could not just "flop" off to the sides. Mr. Turkey Bird is currently sitting in the bottom of our refrigerator waiting to be roasted tomorrow. Tonight's dinner mission was more of a back-up plan as my original idea took longer than I had time for and my day was consumed with unexpected errands. Oh well, at least we didn't result to going out to dinner and I'm sure what I made was way healthier for us than any fast food place. I originally found this recipe earlier this year when my daughter was playing with her Hawaiian-themed American Girl doll, Kanani, and she asked me what type of food they ate in Hawaii. Having never been there, the only way to figure this one out was to go online and do a little research. After some surfing, I came across a website, Polyneasin Culture Center, dedicated to Polynesian foods and decided Huli Huli chicken seemed simple enough to try and I figured my daughter would eat it. Typically I would serve this with grilled pineapple, but given that it is October I doubt that a fresh pineapple would be very good so I opted to use different sides I had ingredients for already. I asked my husband to pick up pineapple concentrate on his way home from work because I realized I hadn't got it when I went grocery shopping last week because the store I was at didn't carry it anymore. Well, sometimes sending someone else to the store doesn't work out like you plan and my husband thought I meant pineapple juice. 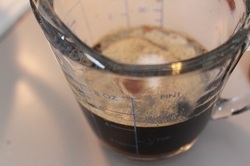 Oh well, I decided to roll with it and opted to include 1 cup of juice in place of the 1/4 cup of concentrate. It didn't change the flavor so if you can't find concentrate, pineapple juice will work too. 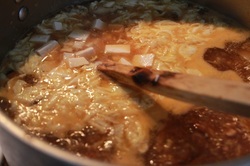 In a small bowl, whisk together pineapple juice, chicken broth, white wine, ketchup, soy sauce, ginger, and Worcestershire. 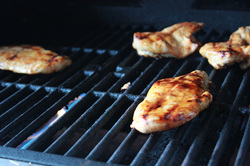 Place your chicken breast on a hot grill and brush sauce. Cook about 10 to 15 minutes then turn. 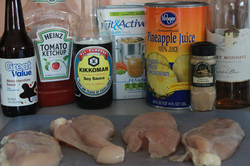 Continue to brush with sauce as the chicken is grilling. 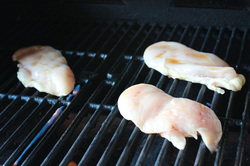 Brush this side with sauce and continue to grill 10 to 15 minutes or until internal temperature reaches 165 degrees. Serve with your favorite sides. Tonight we had rice pilaf and broccoli. Tonight's dinner mission is brought to you by the request of my little girl. About five years ago, we visited Disney World and while browsing around one of the many gift shops I found a "Cooking with Mickey" gourmet cookbook. I decided it was a must have for my cookbook collection and I'm glad I bought it. There are several recipes I love in that book and so many I haven't had time to try; however, I'm planning to change that. The directions are actually for cooking it on the stove top, so I have altered it slightly to meet my needs as a crock pot meal. It was my busy cleaning day and again I just wanted dinner to cook while I did my thing. 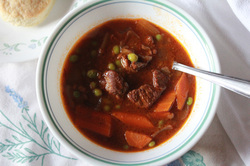 This definitely works well in the crock pot and is good on a chilly fall evening like today. 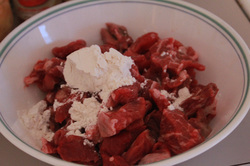 Add flour to stew meat, toss to coat. 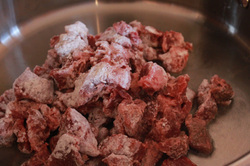 Heat oil in a skillet and add flour-coated meat and brown. 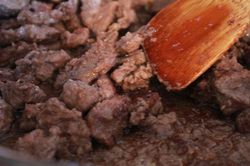 Once meat is browned, remove from pan and place in crock pot. While meat is browning, chop up your vegetables. The veggies should be chunky for a more rustic dish. 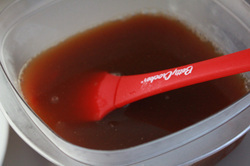 In a large bowl or measuring cup, mix gravy according to direction on package. 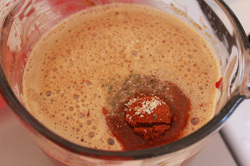 Add tomato paste, paprika, garlic salt, salt and pepper to gravy and whisk to combine. 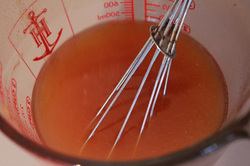 In a large measuring cup or bowl, combine water and bouillon cubs. 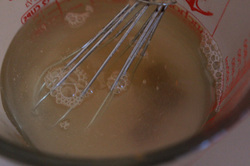 Whisk together until bouillon dissolves and resembles beef broth. 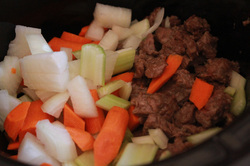 Add vegetables to crock pot with stew meat. 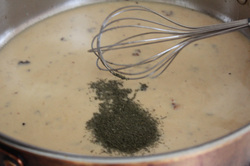 Pour in liquid ingredients and add bay leaf. Simmer on low 8 to 10 hours. 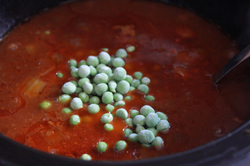 About half an hour before stew is done, stir in peas. Serve with your choice of bread. 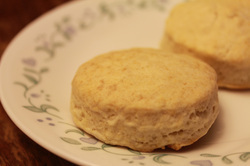 I used the baking powder biscuit recommended in this recipe. 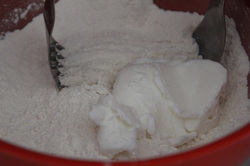 In a medium bowl, combine flour, sugar, baking powder, and salt. Mix well with a fork to distribute ingredients. 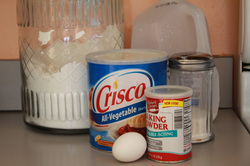 Cut shortening in with two knives or a pastry cutter. 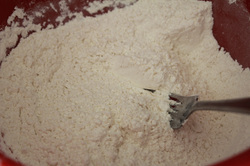 Flour mixture should be slightly coarse. 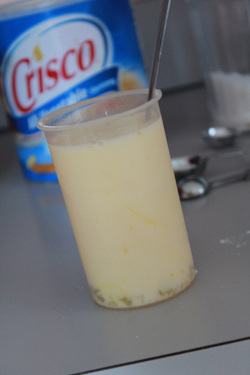 I used my measuring cup to combine the egg and milk. I figure if there's room, no sense in dirtying more dishes. 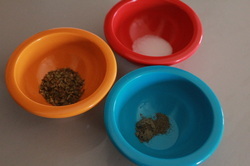 You could also do this in small bowl. Stir until dough forms. 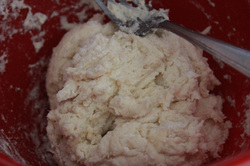 You can use your hands to knead the dough smooth. 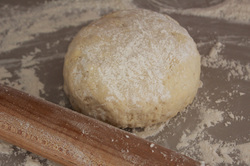 Turn dough ball out onto a well floured surface. 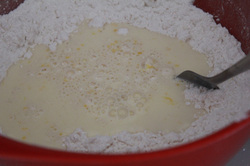 This dough will be sticky so apply a thin coating of flour to the dough. 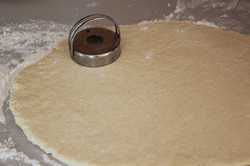 Roll the dough out to 1/2 inch thick. 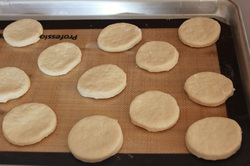 Using a biscuit cutter, cut approximately 12 to 16 biscuits. Place on a greased cookie sheet. I used my silicon mat instead. Bake approximately 12 minutes or until golden brown. Tonight's dinner mission was to make a wonderful Sunday dinner. 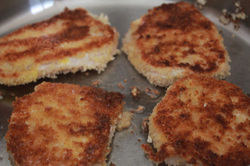 I decided to try the Pork Schnitzel recipe I came across online at SimplyRecipes.com. This is a fairly easy recipe to make and everyone seemed to enjoy it - though my daughter did opt to leave the sauce off of hers. I was ok with that too. Preheat the oven to 350 degrees. 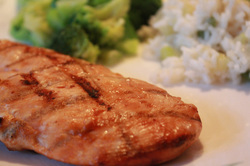 Use a meat mallet to flatten pork chops to about 1/4 to 1/8 inch thick. 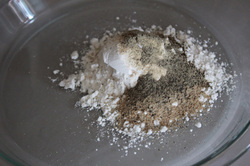 In a shallow dish (I used my pie plates), combine flour, season salt, and pepper. 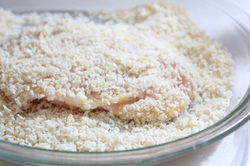 In another shallow plate, combine panko crumbs and paprika. 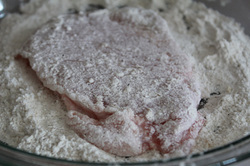 Coat pork chops in flour. Move pork to second step and coat in egg. 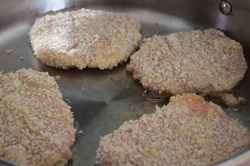 Place pork chop in final step and coat with bread crumbs. Repeat step for remaining pork chops. Heat oil in large skillet then add pork chops. Cook pork chops about 3 to 4 minutes on each side, turning only once. 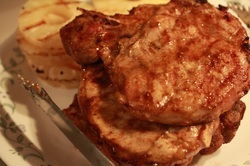 Remove pork chops from skillet and place in warmed oven to bake the rest the way through while you create the sauce. In the skillet you browned the pork chops, add chicken broth and salt. Scrap brown bits from bottom. 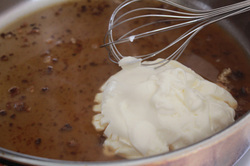 Add sour cream and whisk until a smooth sauce is created. Add dried dill to sauce. Stir dill into sauce and mix well. 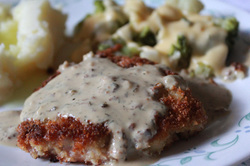 Plate pork chops and drizzle with sauce. Serve with your choice of sides. Tonight we had homemade mashed potatoes with gravy and broccoli/cauliflower with homemade cheese sauce. Enjoy!